Guardian Pharmacy of NWFL is constantly looking for new ways to connect with the residents of the communities we serve. Most recently we have had the opportunity to show a new way to connect. Our Nurse Account Manager, Stacey Quinnell, has a registered service pet therapy dog named Tater. She and Tater have visited quite a few of our residents in our service area. According to an article in goldencarers.com, Dr. Jay P. Granat, a New Jersey psychotherapist says that pets may actually help seniors live happier, healthier lives. Dr. Granat says that contact with pets on a regular basis has been shown to improve cognitive functioning, balance emotional concerns and increase feelings of enthusiasm and interest. The role of pets is important for residents of nursing homes or that are in some form of assisted living community. Numerous studies have shown that pets’ interaction with residents are capable of lifting the atmosphere in these communities. Some of these studies also show that pets may actually delay the aging process. These pets also boost the activity levels of the elderly, and dogs especially help people keep an active routine. Stacey and Tater have made quite a few visits in the last several months. The residents are always so happy to see them and the level of interaction between the residents and Tater is always uplifting. Thank you to Stacey and Tater for bringing another added service to the communities we service. 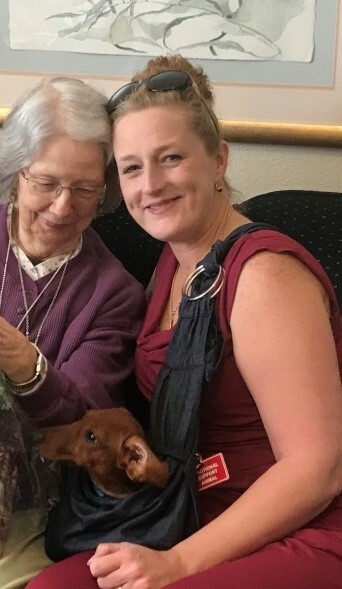 Pictured is Ms. Gloria Bryan from Summer Vista in Pensacola, Florida along with Tater and Stacey Quinnell, Nurse Account Manager with Guardian Pharmacy of NWFL.